Although this is an expensive laptop, it is an excellent one as well. It’s one of the best of the year 2018. Every inch of it feels premium because of the specs and the sleek design. 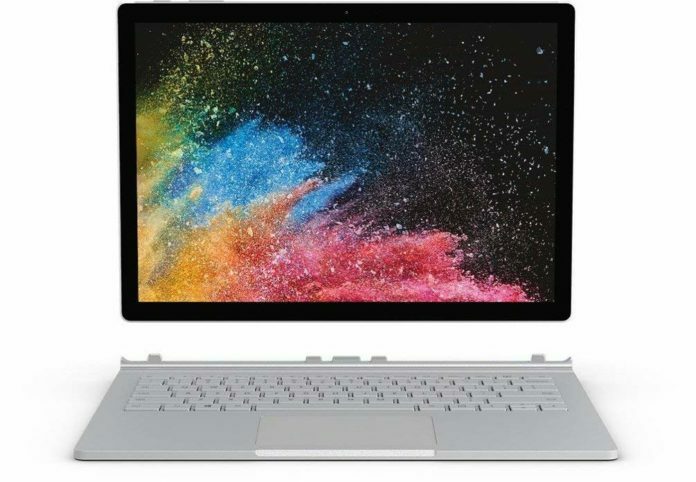 The ones with deep pockets will love this Microsoft Surface Book 2 very much(see the lowest price). It comes with an Intel i7-8650U processor, 256GB SSD, 8GB of RAM and a dedicated Nvidia GeForce graphics GTX 1050 of 2GB. This is a quite powerful machine. You can do any task with it, even play some more demanding games. This is a laptop/tablet hybrid. The screen can be detached from the keyboard and used as a tablet. This is something that can be pulled off by cheaper laptops as well. Getting it right it’s tricky though. This Microsoft machine manages to nail it right. You also have a stylus which works very well if you don’t like using your fingers. Usually, windows machines work better with a keyboard, but it will serve you in tablet mode as well. Screen resolution is very impressive(3000×2000), and it also has a higher pixel count, higher than MacBook Pro’s Retina display. This means that the text is very sharp, colours are vivid and bright and it’s a joy to look at. Typically it’s difficult to squeeze quality speakers inside a thin laptop. Many manufacturers can’t manage it. Microsoft got it right in this case. Audio quality is very good with notable bass and a reasonable volume listening without problems. You may be impressed with the quoted battery life of 17 hours. In reality, there are more like 12, and that’s with the keyboard attached. This laptop has two batteries, one inside the keyboard and one inside the screen. In tablet mode, you’ll have about 3 hours of battery life, which is quite low. Now don’t get me wrong, 12 hours it’s still a good battery life, well above average but nowhere near 17. The top of the laptop is more massive than the bottom. That’s because of all the tech that has to live on the screen rather than the bottom. This makes it hard to use the laptop in your lap, and the slippery surface of the base makes it worse. But this minor issue is fixed if you hold the computer on a flat surface. It’s not about if you should buy, it’s more like if you want to buy it. The specs and the premium built quality make this Microsoft Surface Book 2 desirable. However, it may be over-specced and over-designed for casual users. A laptop costing half of the price may do the job well for them. All things aside this is the cherry from the top of the cake laptop.